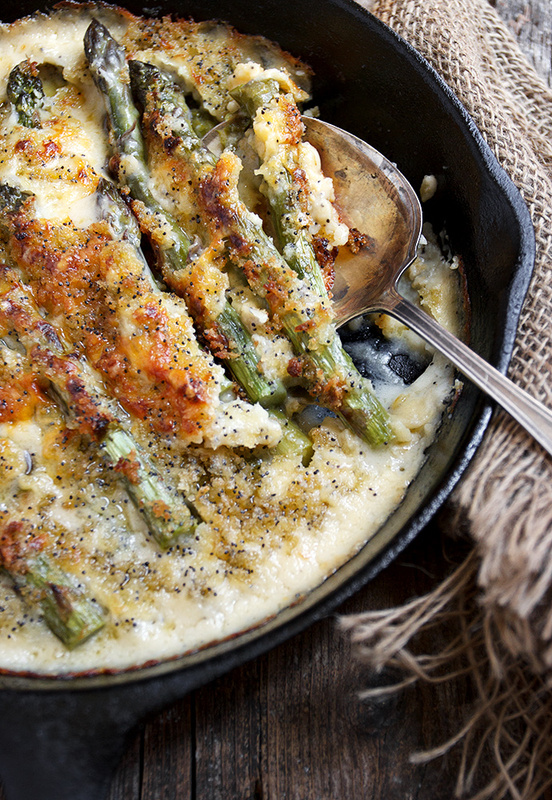 Who doesn’t love baked asparagus with cheese sauce? 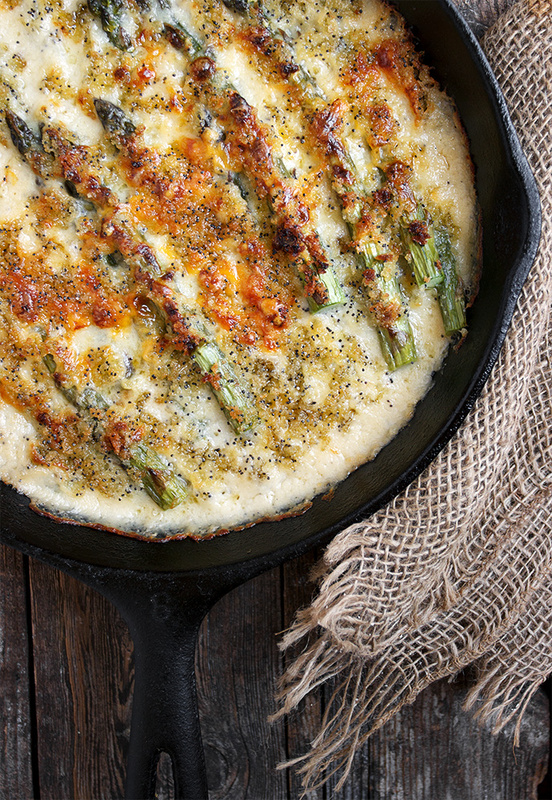 This Skillet Asparagus Supreme features beautiful fresh, roasted asparagus and cheese, all dressed up in a creamy cheese sauce, with a cheddar and buttered panko topping. It’s finally local asparagus season here and I couldn’t be happier! Asparagus is such a versatile vegetable, delicious raw or cooked. Enjoy shaved, raw asparagus in salads (use your vegetable peeler) or simply steamed. You can also quickly and simply roast asparagus on a sheet pan in a 400 F. oven, with a bit of butter and Parmesan. Finally, add cooked asparagus to casseroles, stir-fries or noodle dishes. You can also freeze asparagus by blanching it for a few minutes in boiling water, rinse under cold water, dry and then freeze. 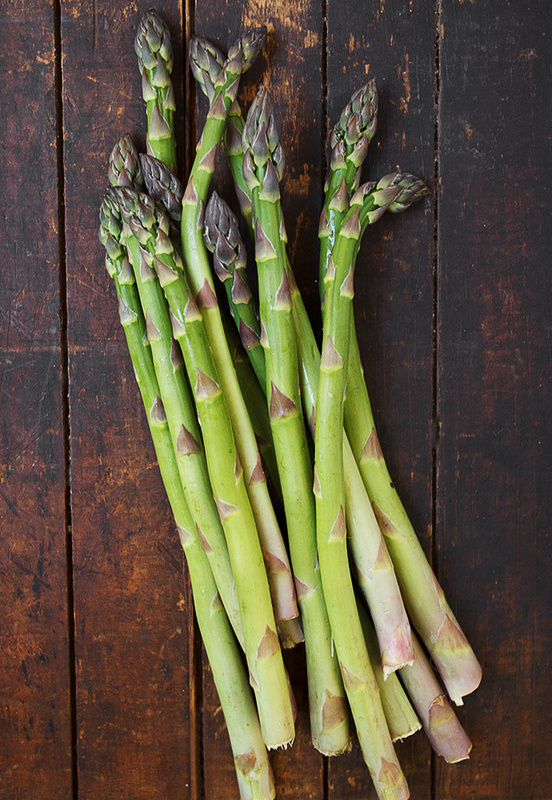 Local asparagus is available only for a short time, so it’s well worth stocking up now and enjoying it all kinds of ways or freezing to extend the season! 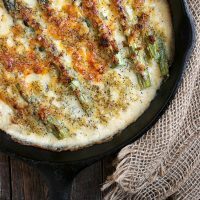 When I’m in the mood for doing something a little special with asparagus, this Skillet Baked Asparagus with Cheese Sauce is my go-to dish. 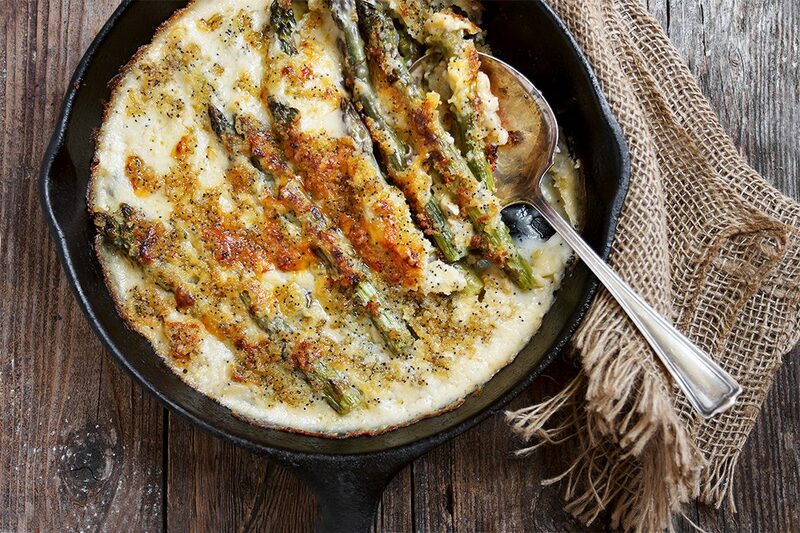 This dish tops fresh asparagus with a quick, creamy cheddar sauce, then is topped with a buttered panko topping, some more cheddar cheese and a few poppy seeds for colour and flavour. It’s then popped into the oven for about 20 minutes, to deliver perfectly cooked asparagus in a lovely creamy sauce and crispy topping. 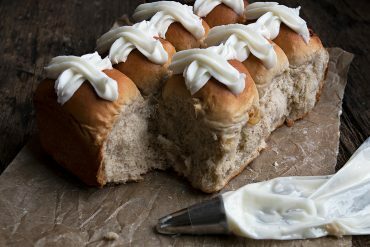 You could prepare this ahead by preparing it right up to the baking part, but instead allow to cool slightly, cover well and refrigerate. Simply bake when ready, allowing a few extra minutes if it’s cold from the fridge when it goes into the oven. 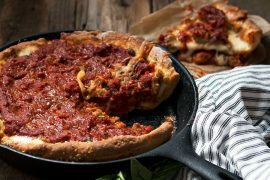 A cast-iron skillet works really well for this dish, but any baking dish would work, as long as your asparagus can lay nice and flat. A delicious and special asparagus dish, that can be assembled ahead and baked when ready! 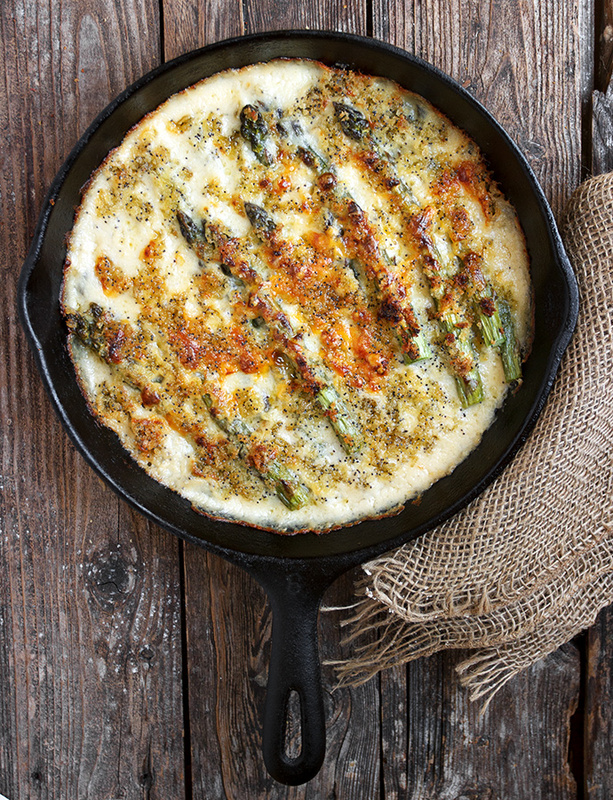 Preheat oven to 350 F. Prepared asparagus and lay flat in an oven-proof skillet or baking dish. In a medium saucepan, prepare sauce. Melt butter over medium heat. Add the cornstarch/water mixture, stock, salt, pepper and milk and cook, stirring, until hot and thickened. Stir in cheddar cheese and stir until melted. Pour sauce over asparagus (I like to pour it more over the middle, so that the tops and bottoms of the asparagus poke through a bit). Make the topping by combining the panko, melted butter and poppy seeds in a small bowl (You can add a bit more panko if it seems too buttery). Sprinkle grated cheddar cheese over-top of sauce and then top with panko mixture. 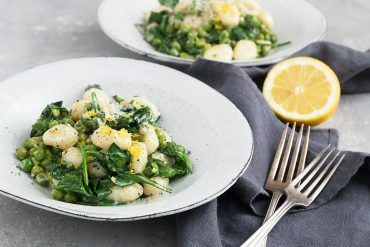 Bake in preheated oven for 20-25 minutes (20 minutes for tender-crisp asparagus to 25 minutes for softer, depending on the thickness of your asparagus. Times would be for thinner asparagus). This seems like an amazing recipe so I can include more asparagus into my diet, Jennifer! Keep up the great work. Here I am swearing I will be more healthy this week and you post this creamy delicious looking dish! YUM!! Always looking for new asparagus ideas, especially this time of year. This sounds phenom! Made this on the weekend. What can I beside YUMMY! My husband was skeptical but he said the dish turned out much better. Have to admit my presentation wasn’t as good as yours. 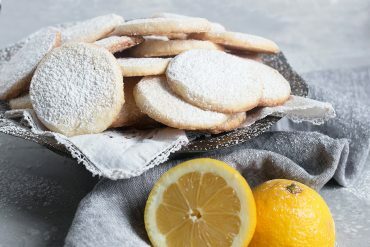 Such a delicious side! I’m always looking for new ways of dressing up asparagus, this is one for me. 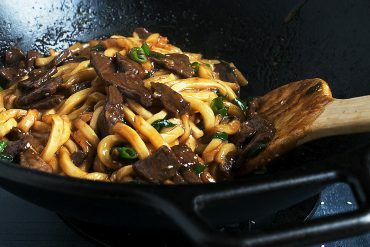 This recipe will be added into my cooking file, it’s a keeper! Thanks Jennifer for another fab recipe! Wow, Jennifer, you have taken one of my favorite vegetables to creamy, decadent new heights! This asparagus looks seriously amazing! 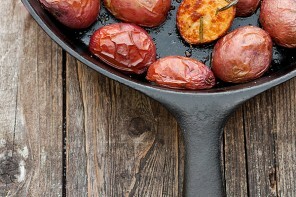 I most definitely could polish off that skillet all by myself, forget company… I don’t share things so delicious! ;) Cheers, friend! What a perfect dish for dinner! My husband and I love cooking with asparagus and always have a big batch in the fridge. Will add some day old bread into this skillet and call it a meal. YUM! Thanks Maggie and what a perfect idea to add day-old bread! This would be so elegant for a dinner party. I love everything about it! Thanks Chris and yes, it’s a great dish for entertaining! I can never have enough asparagus and I just gobble it up during our short season. I’ve pickled 6 jars of it so that’s a start, lol. I love that you love asparagus so much! You have the best recipes for it on here. 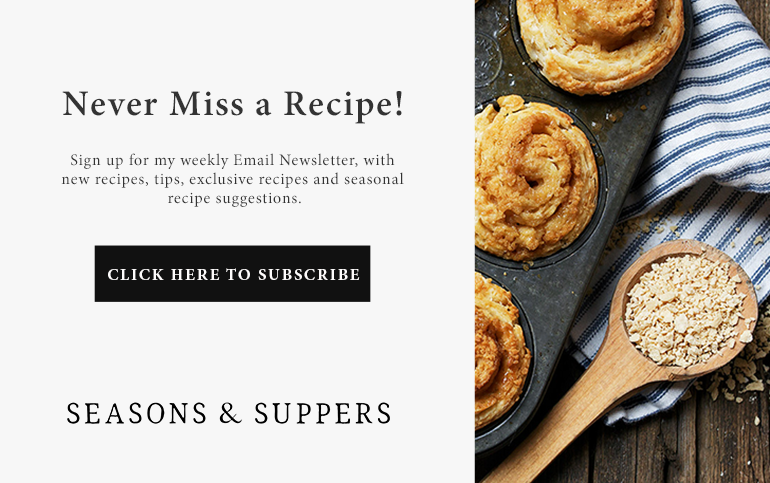 In fact, I think it was a random asparagus recipe that brought me to your blog originally! Definitely saving this one! It looks awesome. Thanks Katrina :) I think you will love this one! 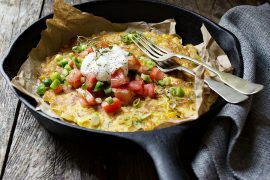 I would so make an entire dinner of this—that whole skillet would be MINE :) I love that you used cheddar cheese, it has so much flavor, and that sprinkle of poppy seeds is genius! Cheese and asparagus – two of my favorite ingredients! Our asparagus patch is done already this year but I can still find it in the stores. Love this dish and love that you can make it ahead. So pretty! Jennifer this looks incredibly delicious! I LOVE asparagus and a cheese sauce? I’m always up for that! Looks so pretty in the cast iron skillet too. Thanks for sharing this one! Ohh wow! I love how creamy and tasty this looks. I happen to have all of the ingredients minus the asparagus… I’ve gotta pick up some right away! 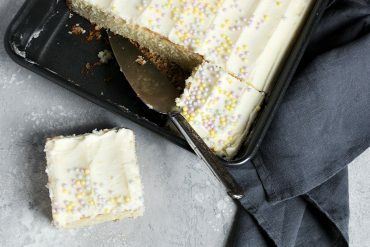 Looks very delicious, love the photos too. Pinned! Thanks Vivian. It’s a delicious way to enjoy asparagus :) Thanks for sharing!